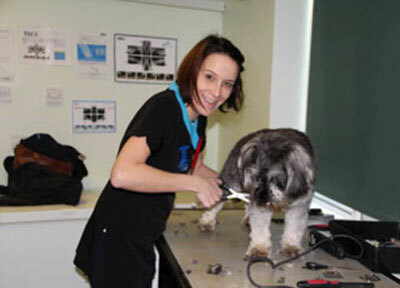 Andrea Harrington is our experienced groomer, providing clipping, brushing, and bathing services within the practice. She has many years experience and is happy to offer grooming for both dogs and cats. Previously, Andrea has worked in rescue centres and helped to treat and care for ferrel cats. Due to this, she has a skill for handling and calming animals like no other. We understand that many animals do not enjoy being groomed and that’s why we have provided the service, to ease anxiety for both owner and pet. Our aim is to make the grooming procedure as comfortable and as quick as possible. Please contact Andrea to discuss your requirements, whether it be a classic breed cut or a personal preference! 02380 620 607. Now discounted on Riverside Vet Plan!